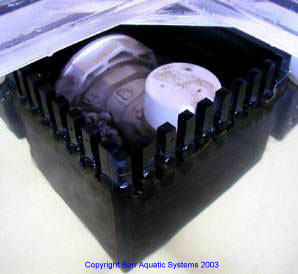 These overflows can be used to retrofit an existing tank, or to add unique features to a new tank. Two standard sizes are available, custom sizes can also be built to order. Each overflow now has custom milled slots. This prevents teeth "break-out", and allows the water to sheet down the inside edge, which can greatly quiet the water flowing though the teeth. Looks the same from the sides, but has a clear bottom instead of an opaque black bottom. Lets you look though the box to spot things underneath it. Lets more light in to the box- Fish can't hide in the dark corners of it anymore. No additional charge- Just specify at order time. Precision machined 1/4" x 1" slots, on 1/2" centers. Teeth on three sides, use in a corner or in the middle of the wall. 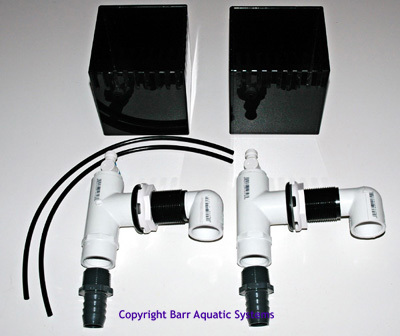 Bulkhead and plumbing kits available separately. 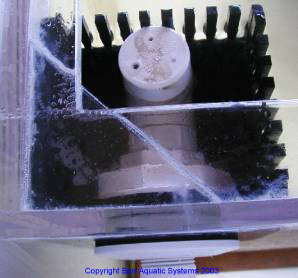 The water rate though the teeth will determine the water level in the tank. Position the boxes so that if the teeth get partially clogged, the water will overflow in to the top of the box before it overflows the tank. The flow rates below are based on my testing, your results may vary as the rates depend greatly on your plumbing. Do not use the maximum flow rate, always leave 20-30% of a margin for buffer. 6x6, Corner (12" of teeth): Maximum 1200 gph, typical 800 gph. 6x6, Middle (18" of teeth): Maximum 1800 gph, typical 1200 gph. 10x5, Corner (15" of teeth): Maximum 1500 gph, typical 1000 gph. 10x5, Middle (20" of teeth): Maximum 2000 gph, typical 1400 gph. These kits include everything you need to plumb the overflow, available with the purchase of any overflow box. Use the included hose barb for clear vinyl tubing, or the female threads for hard PVC plumbing. Retrofit to an existing acrylic tank-Simply lower the water level, drill the hole for the bulkhead, and install the unit. 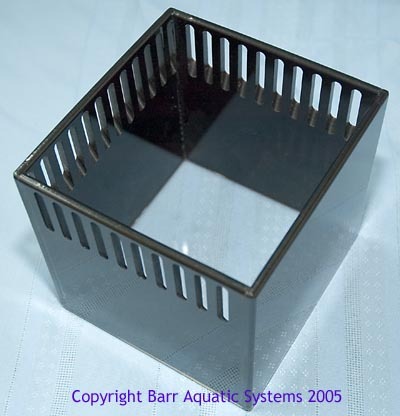 The 1.5" bulkhead clamps the unit to the tank, and the gasket on the outside of the tank makes it waterproof.